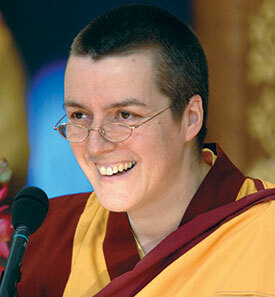 Gen-la Kelsang Dekyong is the General Spiritual Director of NKT-IKBU and Resident Teacher at Manjushri KMC. Born in the UK she has been studying under Venerable Geshe Kelsang Gyatso for over 30 years. Ordained as a Buddhist nun, Gen-la Dekyong has devoted her life to helping others by promoting modern Buddhism. She teaches at major events throughout the world is well loved by thousands of students for her ability to touch their hearts by showing how Buddha's teachings are directly relevant to their lives today.